A Planetary Society produced mini-DVD is on board each Mars Exploration Rover spacecraft, mounted to the lander petals. These DVDs are designed to engage and involve the public in numerous ways. After landing on Mars, both rovers captured images of the DVD before driving away from the lander. Each DVD carries nearly four million Mars enthusiasts’ names collected by NASA. 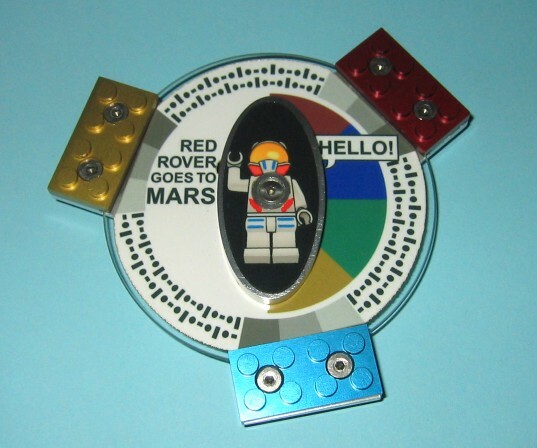 Each DVD’s engaging design includes the “Astrobot” LEGO mini-figure representation in the middle, magnets to collect dust, colors to study color appearance under a Martian sky, LEGO brick representations to engage kids, and secret codes around the outside to be decoded from images on Mars. Astrobots Biff Starling and Sandy Moondust (one on each DVD central oval) are LEGO minifigure representations suited up for space. Their job was to tell their stories to the world through a series of entertaining online communications between themselves and the ground available via the Web. The DVD is made of silica glass rather than plastic so that it can withstand the high temperatures necessary to sterilize it of Earth microbes before it is sent to the Martian surface. Also, the silica glass has a much longer lifetime than typical commercial DVDs—in fact, the silica glass DVD could last more than 500 years. The DVD will remain on the lander as a time capsule for a future generation. The DVD assembly’s base, the simulated LEGO bricks, and the central oval are made of machined and anodized aluminum. The aluminum parts are separated from the silica glass DVD with Delrin pads. Delrin is an inflexible polymer that is very tough and heat resistant. The entire assembly, which weighs 69 grams, was subjected to a battery of tests designed to simulate the extreme environmental conditions of the journey to Mars: temperature cycling from -125 to 60 degrees Celsius, exposure to vacuum, high-speed random vibration, and shocks of 4,000 times the acceleration of Earth’s gravity. The Planetary Society, in collaboration with the LEGO Company, provided the DVDs to NASA for the Mars Exploration Rover mission. Visionary Products, Inc. implemented the DVD mounting assembly, Plasmon OMS donated the silica glass DVDs and data etching, and the magnets were donated by the Danish magnet team who also have other magnets on the spacecraft.